Wouldn’t it be nice if you could get instant freedom from fear, anger and depression? That’d be great. Would you commit to attending a week-long seminar if you could get instant freedom from it? Today I was looking through a booklet titled Ten Reasons for Alumni to Be Encouraged. It was sent out in 1992 to families that had previously attended a Basic Seminar. While working very hard to look like an informational booklet, this mailing was really nothing more than an advertisement meant to bring money in from seminar alumni. Throughout the booklet there runs a theme of instant solutions to all your problems. The image above is perhaps the most blatant promise of instant solutions, but it is far from the only one. Before we take a look at them in more detail, you can enjoy some non-approved music. 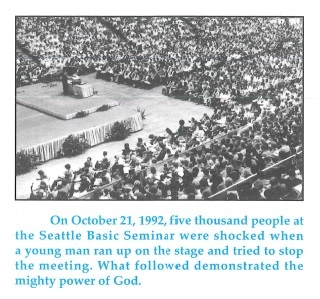 Gothard recounts the story of a young man who rushed the stage during a Basic Seminar in Seattle. The man was subdued by security, and taken to a side room while Gothard continued the meeting. During the break, Gothard visited this man and tried to help him. The man said that he had heard a voice claiming to be “the Prince of Seattle” who had told him to stop the seminar. Here we have a man who obviously has some rather serious mental health issues. He is hearing voices with enough clarity and force that he will rush the stage in front of 5,000 people, and has to be forcibly removed. He admits to frequent thoughts of suicide. These are not minor, small issues. This guy needs help. Now let’s look at the help that Gothard offered. 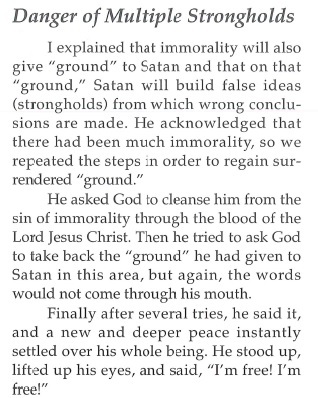 First, we should note that the concept of giving ground to Satan, and reclaiming ground from Satan, is not Biblical. The Bible teaches us that our old man is sinful by nature, and that we are in the process of being transformed into the image of Christ. It does not teach a chessboard version of the soul, with Satan as an easily defeat-able opponent if we simply follow Gothard’s three step plan. 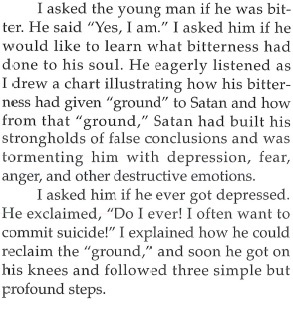 Second, note how this promise to free someone of fear, anger and depression comes with major strings of guilt attached; if “depression, fear, anger and other destructive emotions” are the direct result of Satan building a castle on surrendered ground in your soul, then anytime you experience any of those emotions, you can be sure that you have failed. You’ve given ground to Satan, again. Third, it’s interesting to see how anger and fear are listed as “destructive emotions.” Anger is actually a very healthy emotion under some circumstances (to give a random example; if you heard a story about an elderly religious leader using his position of authority to make unwanted sexual advances on teenage girls…well, that should make you angry.) In many cases, fear is a healthy emotion (again, a totally random example; if you were a teenage girl who was sent to work with an elderly religious leader who gave you money to purchase a push-up bra…well, you should feel fear!) Negative emotions are not always destructive emotions. This is an important distinction. So, to continue the story; Gothard had this guy go through the three steps (confess the sin, claim the blood of Christ and ask God to retake the ground from Satan), and “a peace came over him.” But then the story gets even more interesting; the man asks, “What about the beast I see with seven heads?” Gothard asked the man if he had participated in any sexual sin, and the man said yes. Notice how quickly this “freedom” the young man gained is lost! It seems Gothard himself doesn’t even realize the inherent contradiction in his story; he promises freedom, but only if you take back every single stronghold. How are you to know if you’ve confessed them all? How are you to know if you’ve taken back each piece of ground? Since very natural emotions such as anger or fear are the signposts of ground that has been given to Satan, how are you to ever feel confident that your soul is truly safe? The most disturbing part of this story comes when this young man tries to ask God to take back the ground, and the words stick in his mouth. We can learn something very scary about Gothard’s entire view of the Christian experience from this; when someone was bound by sin, and needed to turn from it, he had to rely on his on strength to do it. There is no mention of calling on God for strength, or turning to your Christian brothers for support. Nope, you just sit there, bound by Satan and this stronghold that he’s built in your soul, until you find the umph within yourself to speak the magic words. There’s been an interesting development regarding the previous post ; Olivia Brodock left a comment explaining the reasons for writing her blog post and what she intended to communicate. It’s worth looking at. Before getting into today’s topic, I wanted to briefly follow up on something from a previous post about rock music. Gothard had referenced some research that showed rock beats caused problems in lab rats. I’ve managed to track down the original study. It was published in the fall of 1987 in the Bulletin of the New Jersey Academy of Sciences, under the title Neural Plasticity of MUS musculus in Response to Disharmonic Sound. The research was conducted by Gervasia Schreckenburg and Harvey Bird. Several staff and faculty members at Georgian Court University were extremely helpful in tracking down the information for me. Now, back to redefining reality: twisted definitions from Bill Gothard. Read part 1 here. Well, the wording is a little bit confusing here, but let’s try to unpack it. If you are feeling guilty, and you are told that you are experiencing “false guilt,” that means…that you’ve done something wrong. Example: I recently purchased a new cellphone. My old phone was about two inches away from completely dead, and I really did need a new one. My wife did not need a new phone; she repeatedly told me that her phone is fine, and that there was no point in spending the money on a new one when the old one worked just fine. And yet I felt extreme guilt about it. I felt very strongly that I shouldn’t buy myself a phone until I’d bought her one. Several friends and family members (including my wife) assured me that there was no reason to feel guilty. Thanks to Gothard’s teachings, I tend to always feel like I’ve never done enough for other people, and to feel guilty about getting myself something. This is false guilt. I do not have to feel guilty about buying myself a phone. But according to Gothard, my false guilt over buying the phone is a sign that I am actually feeling guilty about something else, something far more serious. Apparently I’ve committed some other, greater sin, and my sub conscience knows that my friends won’t excuse that sin, so it transfers the guilt to a less grievous crime. You see what this does? Gothard sets up a nice little circle of condemnation. If you feel guilty, then you have done something wrong, period. There is no room to realize that you have been taught a lie, or that a preacher has placed the legalistic restrictions on you that are contrary to the freedom Christ gives. Even if you come to understand that you should not feel guilty over a particular action, you are left in a worse position than before. Now you feel guilty, and you don’t even know what you feel guilty about! There is some vague greater sin that is lurking behind your conscience. Gothard references Romans 2:15 to back up his definition. As usual, Gothard completely ignores context. Paul is speaking specifically about Gentiles who did not have the law (which, at the time of Paul’s writing, meant they did not have God’s word at all), and is pointing out that even these Gentiles have an understanding of right and wrong. Flattery can only be flattery if you’re talking about an unchangeable? You can’t flatter someone because of their piano skills, or cooking, or that big deer they shoot? This definition isn’t so much dangerous as it is just odd. Who would think this is a complete definition? Using Gothard’s terminology, this verse becomes “So if the Son gives you the power to do what you should, you will have the power to do what you should indeed.” Notice how the focus moves away from what Christ has done for us (He has set us free) onto works (doing what we should do.) This is the very essence of legalism. Again, this is why it is so important that you look up and read for yourself any Scriptures that Gothard references. Now we get back to guilt trips. Frustration, by Gothard’s definition, is a failure. If you feel frustrated, you have failed. So are you frustrated that you have to wear a skirt in windy weather? You failed. Are you frustrated that adults are not allowed to leave training center grounds without permission from leaders? You failed. Are you frustrated that your parents paid for you to participate in a program that consists mostly of hard labor that benefits IBLP? (More than ten years later, and that one still ticks me off.) You failed. There is no room to consider that those in leadership may have made poor decisions, or that they might be building their own kingdom from your sweat. You cannot think of those things, because you, by being frustrated, have shown your failure. Do you begin to see how this teaching is extremely dangerous in the hands of someone willing to take advantage of others? So…yeah, basically nothing that relates to his definition. Typical. I won’t wax eloquent on this one; it’d be better to just refer you to this excellent piece published on Recovering Grace that addresses the problems with this definition (click on “Grace and Faith”). In a nutshell,this definition again moves the focus away from what Christ did for us and to what we must do. Notice that the source of grace is left entirely out of the picture; rather than being about the incredible goodness of God in giving us undeserved favor, it’s simply a “force” that helps us “do things.” Yikes. I…what? Nothing about pointing a group towards a common goal? Helping each team member to bring their best to the team? Working well with a variety of personality types? Read those verses carefully, and then read Gothard’s definition carefully. Try to find how the two relate. (Hint: they don’t.) I’m not pointing this out because I think my readers have a wrong definition of the word leadership, but because I’m hoping to show how incredibly off-the-wall crazy Gothard sometimes is. Liberation is actually “the act of setting someone free from imprisonment, slavery, or oppression; release.” Submission means “the action or fact of accepting or yielding to a superior force or to the will or authority of another person.” These are vastly different things. It’s important to note how extremely passive liberation is with this definition. It’s something that your “divinely appointed authority” allows you. It’s not something you ever fight for, or leave an abusive relationship for. Practically speaking, it’s a list of restrictions that are handed to you. Then you have to find a way to work under those restrictions, regardless of if they are reasonable or not. 20 bonus points to the person who can find a connection between Gothard’s definition and that Scripture. And if you are in Gothard’s world, guess who gets to decide if you were intending to hurt? Someone in authority, of course. You know, the very people who would be in hot water if you told the truth about abuse or neglect. Yep, down means up and up means down. Somebody with a superiority complex doesn’t think they’re superior. Nope, because that would make sense. You see, somebody with a superiority complex actually has an inferiority complex. That’s why we call it a superiority complex. Ok, imagine you take a class and you pay attention most of the time. At the end, you have an average of 92%, worth an A for the class. Yea! That’s pretty good, right? But did you have success in that class? To determine the answer, we need to look at what you “could have done.” If you had paid attention in the class, you could have gotten 100%. By this form of measurement, you have fallen short by 8%. What’s the bottom line here? You are never good enough. Your frustration is a sign of your failure. That failure occurred because you didn’t make use of this force that lies within you and gives you the power to do things God’s way. You cannot speak the truth about those in authority over you, those who add to your burdens, because that would be slander. If this makes you angry, then you are sinning. Why can’t you just show deference and do things the right way to please those in authority over you? You are never good enough. There are a million rules, and 8 steps to overcome this, and 5 principles for that, and 12 truths for becoming that other thing, and you will never do it right and you are not good enough. So today we’re looking at a couple pages from the Advanced Siminar booklet. I’m afraid I don’t know that much about this particular resources: it was a large notebook passed from one of my father’s mentors onto him many years ago. A handwritten note in the cover mentions a seminar in Dallas, TX in 1975. The materials obviously pre-date ATI (no mention of homeschooling is made, and many examples speak as though the reader would be in a school setting), and some of the terminology was later changed by Gothard (for example, “chain of command” was later changed to “umbrella of protection,” although no real changes were made in the teachings.) What caught my eye when glancing through it was the 4 pages of “operational definitions.” Some of them make sense, but others are downright scary. Let’s take a look. So,if you are angry, it’s because there are rights that you have not given to God. In case you are unfamiliar with the concept, Gothard spends a great deal of time in his Basic Seminar explaining how it is important that we give up our rights. Christ gave us his rights when he came to this Earth, and we should give up our rights as well. The problem with this thinking is that it primes people for abuse. Instead of learning about healthy limits, and how to recognize when they were being used, ATI students were taught to treat every wrongdoing as an opportunity to “give up rights.” This is extremely dangerous in the exact type of situations that people at Headquarters and Training Centers often had to face: refusal to pay overtime, solitary confinement for rule infractions, unwanted advances from leaders. This definition portrays anger as a sign of sin on the part of the one who is angry, regardless of the situation. Imagine applying this definition when someone was angry over the murder of a loved one, angry about sexual abuse in their past, or angry about a pastor who ran off with the church’s money. In each of these situations, anger is seen as a sign that something is wrong with the person who is angry. That’s just sick. Let’s look at the Scripture verses listed after the definition, because people often glance at the references, assume the Bible supports Gothard’s point, and move on. This is dangerous, because Gothard is not above twisting Scripture, as we can see here. See? The Bible tell us to be angry (with a warning not to sin while being angry), and Gothard uses that Scripture to support his idea that anger is always a sign of sin. The second verse has absolutely nothing to do with the definition that Gothard has just given us; it’s just a random verse that happens to reference anger. Nothing about understanding the other person, nothing about conveying accurate information; nope, this is plain and simple manipulation. I include this one not because it’s so terribly dangerous, but because it’s an interesting insight into what Gothard sees himself as doing. To him, communication is not about two (or more) people coming to understand each other. Rather, it’s about one person with an objective, and the way he achieves that objective. Oh, and that verse in Proverbs? Again, just a random verse about talking. One-way, much? This is a power-play, plain and simple. You have to conform to my tastes, and I’m not required to do anything. This becomes particularly terrifying when you consider the “chain of command” authority structure Gothard envisions for families; a wife has no alternative but to bow her head, forget her personal preferences and “limit (her) freedom” to conform to whatever her husband demands. In a healthy relationship, that’s not too horrible of a thing. This teaching in the hands of an abuser, or a control-freak, is extremely damaging. I read this to my wife this morning, and she just about flipped out. The issue here (and in so much of purity culture) is that it places a completely impossible burden on women. Intention doesn’t come into the picture at all. If, by her mere existence, a girl “causes” a man to lust, she is defrauding. The focus is taken off of the inappropriate actions of a man who is ogling someone, and places the focus on someone whose most serious crime might be nothing more than existing in the body that God gave her. Never mind “weep with those who weep.” If you have discretion, you will know exactly how to preach Gothard’s talking points! Notice how that verse has nothing at all to do with applying principles? This is a strange teaching of Gothard which boils down to don’t have an opinion. If you are seeking God’s direction on a matter (and keep in mind that this is to be done by going to your “authorities”), then you should bring yourself to a point that you are ok with being “led” (told to go) in either direction. This is dangerous because personal opinions and preferences matter. They are important. They are part of what make you an individual. A person without preferences is not a healthy person. And more importantly, a person taught to suppress their preferences, and taught that they must always follow the directives of those in authority is ripe for abuse. What? No,no, and…What? This isn’t what equity means; it isn’t even close to what equity means! Equity is “the quality of being fair and impartial.” You can’t just declare that a word suddenly means something totally different than what it actually means. And tacking some irrelevant verse on the end doesn’t mean you have good reason to make words mean whatever you want them to. There are several more “definitions” that I’d like to look at (did you know that frustration means you have failed? ), but it’s getting late, so those will have to wait for another time. My bed is calling me! Be sure to like us on Facebook or follow on Twitter so you don’t miss part two!